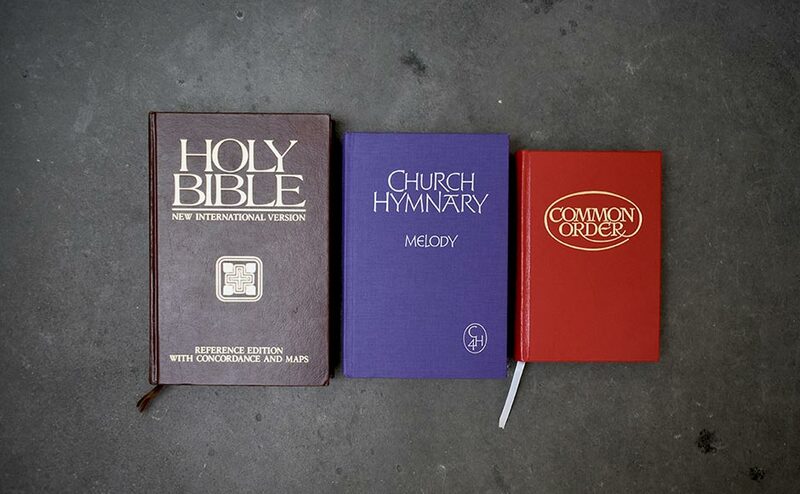 The Church of Scotland uses three main books for worship: the Holy Bible, Common Order, and Church Hymnary Fourth Edition. You can order the latter two books through St Andrew Press where a discount is offered for bulk orders. You may also find books being offered by local congregations on Exchange and Transfer. Information on the Church Hymnary Fourth Edition can be found on music for worship. The Church of Scotland does not have an official version of the Bible that it uses, however the most common Bible used in the Church is the New International Version. Some congregations prefer the New Revised Standard Version or the Good News Bible. At the beginning of each Moderator's term they are asked which version of the Bible they would like to use during the General Assembly that year. The Scottish Bible Society then gifts the Moderator with a copy of their chosen version of the Bible. Common Order is the Church's book of services and resources for public worship drawing from a wide range of church traditions. This book offers complete orders of service, prayers, and a three-year lectionary. Common Order is available to purchase from St Andrew Press for £29.99. Leabhar Sheirbheisean is the Gaelic language edition of Common Order 1994. The book is £6 and can be ordered through the Church. Welcome to a Child £4.99. For parents, those seeking to be baptised, and worship leaders. Many Christian parents seek a rite of reception of their child into the family of the Church which would leave the child free upon reaching maturity to decide for themselves to seek baptism. This book features four orders of service for these situations. By Water and the Spirit £4.99. What it means to be baptised. This book is for all those, of whatever denomination, who wish to explore baptism and Church membership, especially those who seek baptism for themselves or their children. Christian Baptism £1.50. An outline and explanation of baptismal services for those considering Baptism for themselves or their children. The Funeral Services £3.99. The complete funeral section in Common Order 1994, with an introduction for ease of use of ministers. Christian Marriage £1.50. For couples preparing for marriage, including an outline and explanation of Christian marriage services, together with other practical information. The Lectionary £2.99. Scripture readings for Sunday worship throughout the year with an extended introduction on the purpose, shape and use of the lectionary. The Ordinal and Service Book includes recommended prayers, declarations, and benediction for ministers to use during the ordination or induction of a new minister into the Church of Scotland, or the introduction of a minister to a new congregation. This book also contains the official words used during services for the ordination of a deacon, admission to the office of reader, a welcome to members from other churches, linking and union of congregations, and prayers for beginning a Church meeting. The latest edition also includes services for the dedication of a church or a church hall, or closure of a church building. The book is £6 and can be ordered via email.